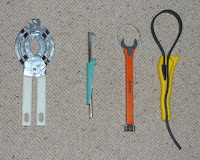 Over the years, we have acquired a number of tools for opening screw-top jars. 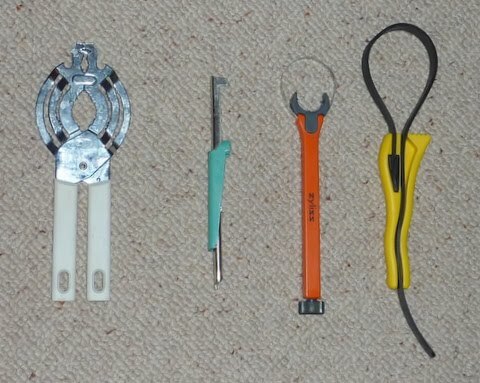 Including the 4 shown here, which are currently in the kitchen drawer. The complicated-looking one with white handles will always open a lid, but will always damage the lid in so doing. 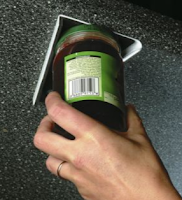 The green-handled one can open lids if used with care, but will also always damage the lid & can even break the jar if set to the wrong notch. The Zyliss job is really for smaller bottle tops & is not terribly good at that. 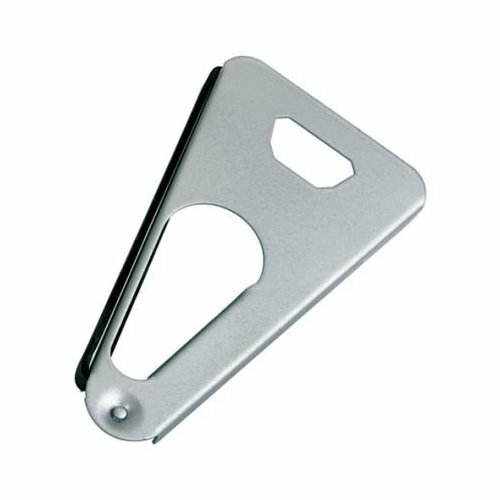 These days, we always go for the Baby Boa strap wrench, which works unfailingly & never damages anything. But it is fiddly to use as the rubber strap keeps falling out of its wavy slot. All of the above have the common disadvantage of needing a co-pilot to hold the jar while the chief pilot operates the tool. Very frustrating on the seemingly-frequent occasions when I desperately need a shot of black cherry jam while DS is out shopping, dancing, learning Spanish etc etc etc. This has led me to tricky escapades with my Black & Decker WorkMate or dangerous Lotus-like contortions wearing rubber-soled shoes on inadequately-prehensile feet. So now I have a second Baby Boa (theoretically for the garage) which can be pressed into service as jar-holder in emergencies. 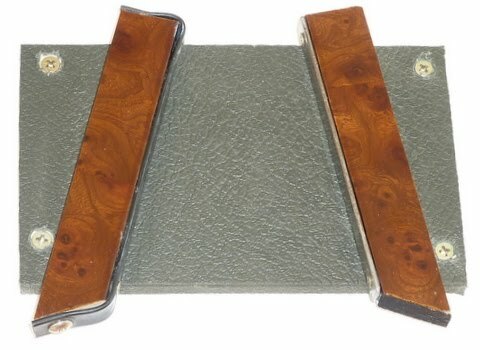 Of course it is even more difficult to keep 2 straps in their wavy grooves than one strap, but when the reward is a jam sandwich, I get there in the end. There has to be a better way & of course there is. I remember seeing, years ago, a metal wedge-shaped device with one high-friction rubber surface. 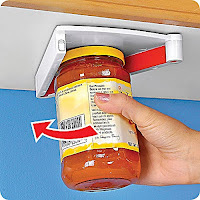 This could be fixed under, say a convenient shelf and then you only have to push the lid into the wedge & twist the jar, when the lid should be gripped in the wedge, allowing it to be unscrewed easily. By one person, or even with one hand. It only handles lids up to 3 inches, which is not enough. I think the curled-over edge on the low-friction side might be a nuisance on some jars? It costs £16 (plus postage). Supposedly handles lids up to 85mm which could be just enough, maybe. But not designed to be under-shelf mounted! If I can find one near €3.95 then I will drill & couple of holes & give it a go. That looks like a nice job & should work for all our jars. But it's $32 (+ p&p, if available from USA). And only stuck on with sticky tape. And seems to be all-plastic, so maybe not very robust? And why complicate it to cope with tightening as well as unscrewing? Simple & robust, not to mention ecological. 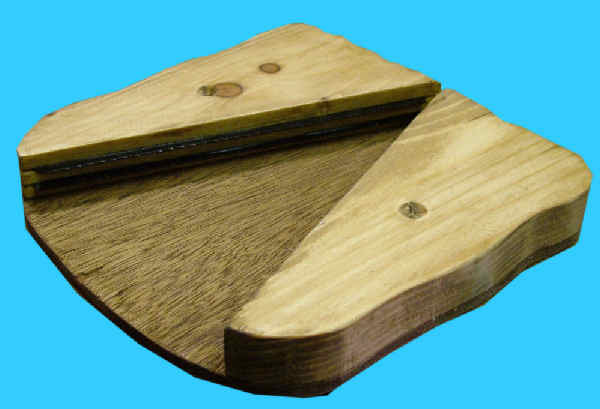 Can't see what they use for the high-friction surface. Plus a number of similar devices, but with metal teeth instead of a smooth high-friction surface, so bound to damage lids. In the meantime (while waiting to find, say, a Westmark at a good price, including p&p if not in a shop) I have tried making my own Old Fashioned Jar Opener. It is assembled from odds & ends from junk boxes (future blog subject?) which may explain/excuse the walnut veneer (old picture frame) & the mock-leather grain (old record-player box). Less noticeable, maybe, are the stainless-steel low-friction face (old curtail rail) & the hard rubber high-friction face (old ski-stick wrist-strap). The fact that it is MkII may help to explain, but can't excuse, the poor design of the attachment of the rubber strap to its bit of picture frame. If/when it fails or I feel like making MkIII then I will do that bit properly, wrapping the strap round well-radiused corners & shifting the screws out of the stressed area. As I said, it works perfectly, so far. At least with the designer operating it. How many subsequent disasters have passed that point only too well? Before crowing too loudly, of course, it would be necessary to get it tested by a panel of adolescents & old grannies. The grannies, to see if it works; the ado's, to see if it breaks. I tell myself the appearance does not matter as it is screwed under a shelf in the pantry.